A tasting cabinet of luxurious fragrance infusions, from intoxicating home aromas to pre-soirée pampering rituals. Make every day of the festive countdown a celebration; the perfect gift for them, a tantalizing treat for you. Make joyful mayhem in the Molton Brown Christmas Distillery. Intoxicating poufs of scented glitter swirl through a merry muddlement of festive aromas. 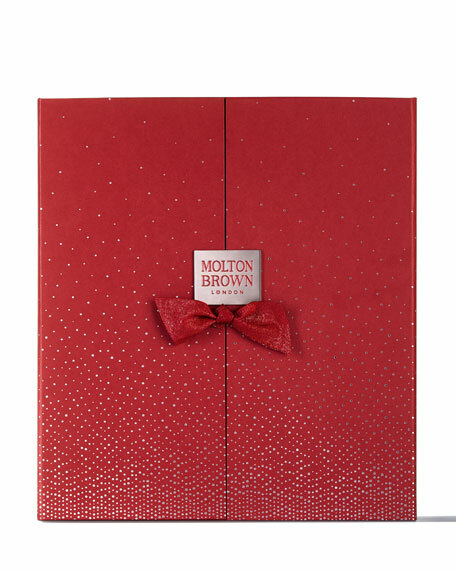 Magic-filled boxes wrapped in sparkling ribbon, ready to reveal curious infusions hidden inside. The surprising spirit of Christmas, brewed with a bang! For in-store inquiries, use sku #2752821.